We’d love your help. Let us know what’s wrong with this preview of Chicken Soup for the Soul by Jack Canfield. Runners will love these inspirational stories about their sport -- the camaraderie, the self-discipline, the energy and endorphins they enjoy, the self-discovery. Includes stories on swimming and cycling for triathletes too. When runners aren't running, they are talking about running, planning their next run, shopping for running... This book contains 101 stories from every Runners will love these inspirational stories about their sport -- the camaraderie, the self-discipline, the energy and endorphins they enjoy, the self-discovery. Includes stories on swimming and cycling for triathletes too. To ask other readers questions about Chicken Soup for the Soul, please sign up. A bunch of stories from runners of all abilities. Newbies to elites. Some of the stories were really good but others were just ok. I'll admit this book seemed to drag on, pretty obvious since it took me two months to finish it. I could only read a few stories at a time without getting too bored. It is always difficult to rate a Chicken Soup for the Soul book because there are so many authors. I picked this up because I was hoping to get back into my slow-paced running routine again. My hope was that these stories would provide inspiration. I must admit that some of the stories did make me want to get out and move. Some of the stories were about runners far more advanced than I or running in events that I have no desire to try. In the same way, some stories were very touching, some were v It is always difficult to rate a Chicken Soup for the Soul book because there are so many authors. I picked this up because I was hoping to get back into my slow-paced running routine again. My hope was that these stories would provide inspiration. I'm not yet at the stage where I "love" running, but this book certainly made me want to continue my challenge. From a 70 year old lady that completed a triathlon just after finishing chemotherapy to motivational stories of people completing a 5k, 10K and marathons. I really enjoyed this book and couldn't put it down. I would highly recommend this book to a runner, or anyone who wants inspiration to become a runner! Lots of great stories - some that make you cry, some that make you laugh. Readers who enjoyed the three books written by ultramarathoner Dean Karnazes, will appreciate his introduction in this book and his personal story as well. Sorry about my attitude. This book proved me wrong. You can find my full review here. strangers into friends. All these stories and many more are shared in a new book in the popular Chicken Soup for the Soul series. Chicken Soup for the Soul: Runners features 101 stories from amateur and expert athletes, beginners and old hands, weekend joggers and Olympic marathoners. There are tales of overcoming setbacks, of running for self, and of running for others. From the moment I opened this book and began reading the tales shared so freely, I was hooked. I couldn't put the book down; I wanted to read more. Each story told me about marathons and injuries, setbacks and goals. I'm still astounded by people who can run marathons, who get out of bed at ungodly hours just to exercise - and even look forward to it! For all my determination, I haven't quite managed that yet. However, with this book in hand, I'm sure I'll have a lot more determination to set and even surpass my own goals. I would recommend this book to everyone, runners or not. I myself am only a walker at this point, but reading about other people setting and reaching their own goals is a message than can be used in every area of life. The stories are inspiring and quick to read and the messages behind them stay with you long after the book has been closed. "In the world of athletics I'm the tortoise, not the hare. Even so, I find great rewards in pushing myself to my limits. It's me finding ou These are my favorites. I went to school and Tanya Newman said "may I see you for minute"? We went down to her room and she said "I saw this and thought of you. 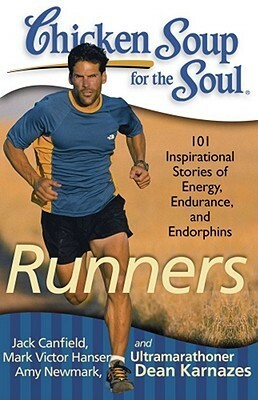 I thought it would inspire you and your workouts..." She gave me the book Chickn Soup for the Soul Runners. Amazing how things happen and people make such a difference in ones life. This gift was just what I needed. I worked out that day and am back on schedule with my training. I am taking my time reading one inspirational story at a time. I even increased my distance running this week and felt great doing doing so. Sometimes I just like reading short stories! I would like to say this book inspired me to head out for a run EVERY day but it didn't! It was a great collection of running stories and I enjoyed reading them and if I wasn't so lazy I probably would have been inspired :-) I recommend this for anyone who has ever laced up their sneakers and gone 'running'! I'm training to run my first 5K in October and before every session I would read a story or three. This anthology was great! It made me feel like I could do it too. I loved each story and even cried after a few. This truly is chicken soup for the soul. Overall, I liked this book. It's really refreshing to read a running book focused more on experiences and triumphs than advice and training plans. I just hope it helps me with the mental wall I'm trying to push through! Inspirational, as all Chicken Soup books are. Stories of all types of runners, from weekend joggers to Ultramarathoners and Ironman triathletes. A lovely collection of stories to keep you inspired. In my humble opinion, Chicken Soup for the Soul books are much better in audio. The stories come to life & motivate that much more. I love reading about running, but I couldn't get into this one. Some inspiring, some trivial. I suppose it takes all sorts but some of these people's stories are a bit too gushy. So far it is a wonderful pick-me-up when I'm feeling down about my running. I grab it when I need a little inspiration. This had only a few stories that bored me. I was pretty inspired and frankly it was hard to sit and read this book...made me want to go out and run! Series of quick, inspiring, and motivating stories. Something in here for all runners that will make you want to lace up and get out there! I loved this book! It was fantastic. Reading all the incredible stories, they totally AMAZED ME! So many amazing stories! A must read for runners! Good Chicken Soup book, lots of inspirational stories. Nice, easy summer read. Stories that inspired me to finish my marathon! Great collection of running stories. I hope they come out with a second volume.